1. Peel off the cover of the adhesive tape on the ProClip. 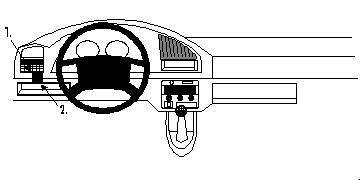 Press the upper part of the ProClip, with groove, into the gap between the air vent and the surrounding dash board at pos. 1. 2. Hook the lower part of the ProClip, with adhesive tape, under the edge at pos. 2.